Two types of VM snapshot are offered. A 'Disk' snapshot contains the contents of the disks (root disk, and data disks if attached). It is also possible to capture the VM memory state (RAM) in a 'DiskAndMemory' snapshot. Neither type of VM snapshot is guaranteed to be application-consistent: there are no guarantees you will be able to restore a VM with applications which are able to re-start from a saved state. VM snapshots are linked 'delta' files. 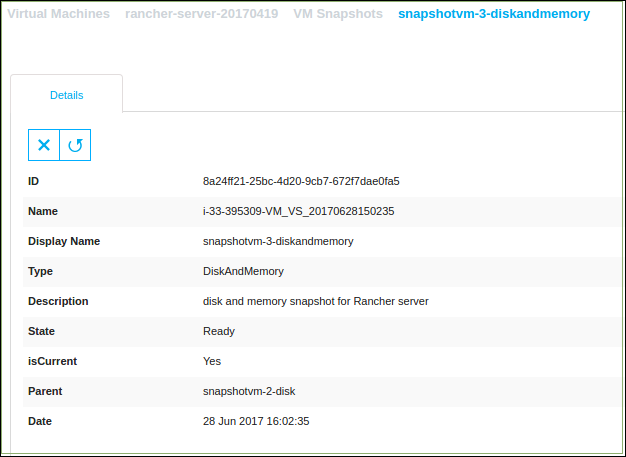 Each snapshot contains the differences between the current state of the VM and the previous snapshot (its 'parent'). The general performance of a VM is affected when snapshot(s) exist because changes are being written to a snapshot file. A VM snapshot should only be used as a temporary 'roll back' copy of a VM prior to making a system change. After the changes are made, and you have confirmed there are no adverse effects, the VM snapshot(s) should be removed. For the alternative of volume-based snapshots (which are simple static copies of disk contents), see How to take a snapshot of a volume and How to setup a recurring snapshot of a volume. 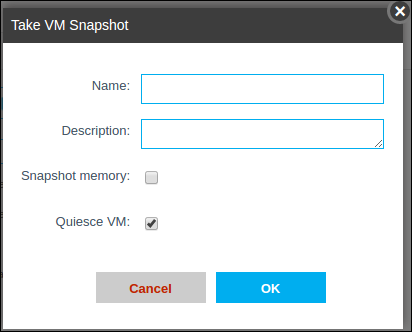 Tick the Quiesce VM check box (ticked by default) to quiesce the VM during the snapshot; this does involve stopping all running applications for a short period, and flushing any application data in memory to disk. Click OK to take the VM snapshot. Click the name of a VM. Click the View Snapshots button in the Details sub-panel: . A new snapshot will have status ‘Creating’, otherwise the status should be ‘Ready’, with a green indicator dot. The 'isCurrent' and 'Parent' columns show you the thread of snapshots and which is the most recent. Delete the VM snapshot: Note that deleted snapshots can be recovered on request for up to 72 hours. Revert to the VM snapshot: The selected snapshot will completely replace the current contents of your VM by reverting it to the state at the moment the snapshot was taken.